Shortly after we came home from Sick Kids my husband and I knew we wanted to give back and raise awareness for Congenital Heart Defects. 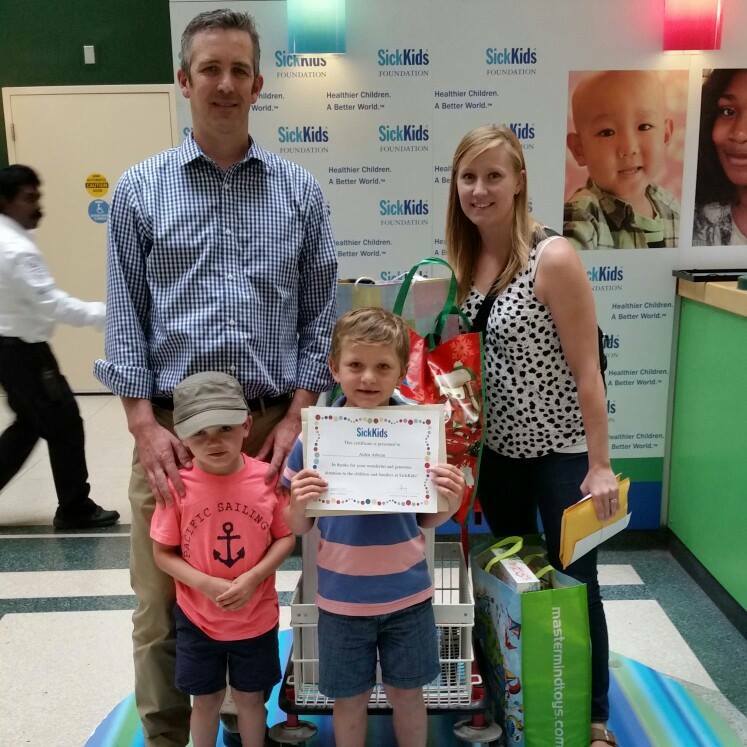 Many parents from the cardiac floor at Sick Kids are doing wonderful things to give back and spread CHD awareness. Our family has been involved in hosting a couple fundraisers as well as volunteering at some and attending as participants. There have been galas, bowl-a-thons, bike rides, walks, Zumba-thon, a video, a book written called “The Mighty O” and a Drumathon to mention a few that were all run by cardiac families supporting Cardiac Kids and Sick Kids. Three I would like to highlight is We Believe in Abby, The Mighty Warrior Blood Drive and my son Aiden’s 6th birthday. During the Evesons’ stay at Sick Kids and a very stressful time for the family, Abby’s parents started a chain of “Paying it Forward”. They were small acts of kindness that came in many different ways. The goal was to help someone smile in hopes they would pay it forward and surround Abby with as much positive energy as possible. It was a sense of control and helping someone out during a difficult time for their family. It did just that by spreading through the hospital, Toronto and in to cities all over Ontario and surrounding Abby and her family with the positivity they need. You can help spread this positive energy with a Pay It Forward yourself #webelieveinabby. Gideon’s mom Jaclyn has started The Mighty Warrior Blood Drive in honor of Gideon who lost his battle to CHD in May 2015. Gideon spent his entire life in the hospital with many surgeries, procedures and blood transfusions. Jaclyn wants to honor her son Gideon and give back with this blood drive, which will run until the end of 2015. The goal set is 409 units of blood, which represents the number of days Gideon was with us. You can go to any donation center to donate and all you need is this partner code INHO368016 to help The Might Warrior Gideon reach 409 units of blood donated. Lastly my oldest heart healthy son Aiden had his 6th birthday this past June. I was all prepared to ask what he wished for this year, but he beat me to it. He asked me if we could send his birthday gifts to the children at Sick Kids to cheer them up. My heart filled with joy that he came up with this nice gesture. I put the plan in to action by contacting Sick Kids and notifying parents what our plan was so they could buy for different genders and age groups. The kids came and they all brought him birthday cards, which we opened and read together. We talked about why he wanted to donate these toys and thanked his friends for helping him achieve his goal to cheer up the children at Sick Kids. We are so proud of him and his idea and look forward to going down soon to meet with the donations department. This is only touching on the many wonderful things that heart families are doing to help support each other and give back. I can only hope we continue to stick together give back and spread CHD awareness.